Here’s a beginners’ guide to change your hostname or computer name in Ubuntu 13.04 Raring Ringtail. The default PC name was set when you were installing Ubuntu. 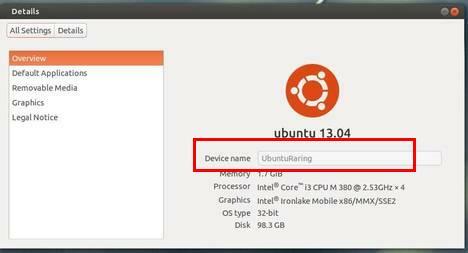 You can easily change it to whatever you want both in Ubuntu Server and Desktop with this tutorial. To check your current name, go to top-right corner “gear” button -> About This Computer. There’s a graphical tool called gnome-network-admin, it provides a simple way to change your computer name in Ubuntu Desktop. If you’re comfortable with editing a configuration file and running some terminal commands it’s not difficult to change your PC name manually. To change your computer name permanently, edit both /etc/hostname and /etc/hosts with your favorite editor and change your previous name to whatever you want.